Hello fellow “arts lovers” and welcome to my new website. I am so thrilled with it. Do you love the new logo? I hope you take the time to explore it and discover all it has to offer. There are tips on how to raise awareness in your community and how to reach out to your government officials to ask for their support of the arts. We have a place holder for the shoe exchange, and I am working on figuring out how to let you know what shoes we have available if you or an organization you know needs them. Exchanging our gently used shoes has already benefited so many kids, I just want to make it grow, grow, grow! One of the most important things I want to share with you is to simply be open to the opportunities that present themselves to you unexpectedly. This happened to me recently when my brother found out that he would be visiting a local school on his Third Semester trip to Belize. They were encouraged to bring along some school supplies to give as a gift from themselves, St. Augustine Prep and the USA to the school children in Belize. Inspiration struck me and I thought why not send art supplies to these children. If they would benefit from some school pencils, how much more would they benefit if they could participate in the arts. 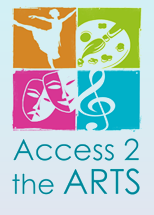 Access 2 the Arts sent along 20 sets of colored pencils for the school. I would have loved to send more, but my brother was told to “pack light” so it took some convincing to get him to take the 20 sets. The kids loved them! I am delighted to share some pictures of the school and the kids below. The real lesson here is to recognize and take advantage of every opportunity that comes along. This was a very small gesture that had a very big impact in the lives of these kids. It is easy to think something is too small to make a difference, but you need to remember that small acts can have big impacts and they add up in the end. Remember “Support the Arts Today and Create A Brighter Tomorrow”.